Like a July 4 fireworks display, a young, glittering collection of stars looks like an aerial burst, as seen in this space wallpaper. The cluster is surrounded by clouds of interstellar gas and dust—the raw material for new star formation. Like a July 4 fireworks display, a young, glittering collection of stars looks like an aerial burst, as seen in this space wallpaper. The cluster is surrounded by clouds of interstellar gas and dust—the raw material for new star formation. 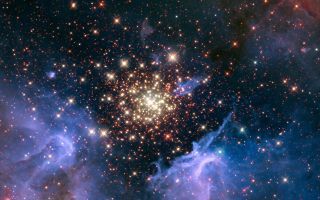 The nebula, located 20,000 light-years away in the constellation Carina, contains a central cluster of huge, hot stars, called NGC 3603.